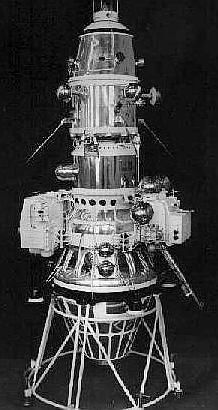 E-6S lunar orbiter spacecraft. The E-6LF and E-6LS spacecraft may have been similar. Russian lunar orbiter. Photographed lunar surface and orbital space environment in preparation for manned missions. Lunar lander, Russia. Launched 1966. AKA: E-6LF. Status: Operational 1966. First Launch: 1966-08-24. Last Launch: 1966-10-22. Number: 2 . Gross mass: 1,629 kg (3,591 lb). The objectives of the spacecraft included the study of: (1) lunar gamma- and X-ray emissions in order to determine the Moon's chemical composition; (2) lunar gravitational anomalies; (3) the concentration of meteorite streams near the Moon; (4) the intensity of hard corpuscular radiation near the Moon. The spacecraft could also be equipped with a television system that obtained and transmitted photographs of the lunar surface. The photographs contained 1100 scan lines with a maximum resolution of 14.9--19.8 m.
Family: Lunar Orbiters, Moon. Country: Russia. Engines: KTDU-5A. Launch Vehicles: R-7, Molniya 8K78M. Projects: Luna. Launch Sites: Baikonur, Baikonur LC31. Agency: Korolev bureau, MOM. Bibliography: 2, 296, 3832, 3845, 6, 64, 12774. 1966 August 24 - . 08:03 GMT - . Launch Site: Baikonur. Launch Complex: Baikonur LC31. Launch Pad: LC31?. LV Family: R-7. Launch Vehicle: Molniya 8K78M. Luna 11 - . Payload: E-6LF s/n 101. Mass: 1,638 kg (3,611 lb). Nation: Russia. Agency: MOM. Program: Luna. Class: Moon. Type: Lunar probe. Spacecraft Bus: Luna E-6. Spacecraft: Luna E-6LF. USAF Sat Cat: 2406 . COSPAR: 1966-078A. Automatic station Luna 11. Further development of artificial lunar satellite systems and conduct of scientific experiments in circumlunar space. Lunar orbit 160 km x 1200 km x 27 degrees. Luna 11 was launched towards the Moon from an earth-orbiting platform and entered lunar orbit on August 28, 1966. The objectives of the mission included the study of: (1) lunar gamma- and X-ray emissions in order to determine the Moon's chemical composition; (2) lunar gravitational anomalies; (3) the concentration of meteorite streams near the Moon; and, (4) the intensity of hard corpuscular radiation near the Moon. A total of 137 radio transmissions and 277 orbits of the Moon were completed before the batteries failed on October 1, 1966. 1966 October 22 - . 08:42 GMT - . Launch Site: Baikonur. Launch Complex: Baikonur LC31. LV Family: R-7. Launch Vehicle: Molniya 8K78M. Luna 12 - . Payload: E-6LF s/n 102. Mass: 1,620 kg (3,570 lb). Nation: Russia. Agency: MOM. Program: Luna. Class: Moon. Type: Lunar probe. Spacecraft Bus: Luna E-6. Spacecraft: Luna E-6LF. USAF Sat Cat: 2508 . COSPAR: 1966-094A. 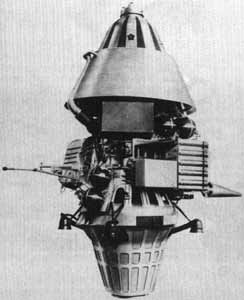 Lunar Orbiter, further development of artificial lunar satellite systems and conduct of scientific experiments in circumlunar space. Luna 12 was launched towards the Moon from an earth-orbiting platform and achieved a lunar orbit of of 100 km x 1740 km on October 25, 1966. The spacecraft was equipped with a television system that obtained and transmitted photographs of the lunar surface. The photographs contained 1100 scan lines with a maximum resolution of 14.9--19.8 m. Pictures of the lunar surface were returned on October 27, 1966. According to contemporary US intelligence sources, only four pictures were returned. Radio transmissions from Luna 12 ceased on January 19, 1967, after 602 lunar orbits and 302 radio transmissions.